The world's most famous Christmas tree has been illuminated for the season, as shining stars like Shakira (and her truthful hips) were on hand to help brighten the night. "My dad was born in Manhattan and I never had the chance to perform at the tree lighting ceremony, so it is... a new, exciting experience," said Shakira. The tree, a 76-foot-tall and 40-foot-wide Norway spruce, comes from the Easton, Conn., home of schoolteacher Maria Corti. Weighing in at 10 tons, it's decorated with 30,000 multicolored lights and topped with a Swarovski crystal star twinkling with 700 energy-efficient bulbs. It will be lit until Jan. 7. Mayor Michael Bloomberg also helped light the Rockefeller Center Christmas tree Wednesday night, ushering in the tourist season for one of the city's busiest holiday shopping districts. Retailers want this year to be just as busy as ever, despite the downturn. "If you're going to celebrate Christmas, New York is the place to celebrate it," said Wendy Gerbier, 33, of Stamford, Conn., who was visiting with her sister Wednesday night. "I'm being much more mindful knowing my money situation could change just like this," Gerbier said as she snapped her fingers. Tens of thousands of people packed the streets around the giant tree under a steady light rain to catch performances by Aretha Franklin, Barry Manilow, Shakira, the Radio City Rockettes and others. "This is our first tree lighting. It's free, it's fun, and it puts us in the Christmas spirit," said Denise McCormack, 33, of Yonkers, visiting with her husband and four children. The evening's extravaganza was just the beginning. During the weeks that the tree is lit, about 750,000 people come through the Rockefeller Center plaza and the below-ground shopping concourse every day, said center spokesman Keith Douglas. That's about 400,000 more people than visit on an average day the rest of the year. Only about one-quarter of the group is there on business. Of the rest, more than half usually come with the intention to shop, Douglas says. So far this season, the center's retailers have been happy with the amount of business, Douglas said. But the bad economy was never from people's minds. "We are a little more careful this year. We've cut back a little," said Robert McNerney, 83, who comes up from Winter Park, Fla. every year with his wife to visit the tree. "But we're still buying Christmas presents for our eight grandchildren," said his 75-year-old wife, Maria. New York City tourism officials say that the period between Thanksgiving and Christmas is the city's busiest time of year, with about 8 million to 9 million people visiting during that time. "You don't need money to celebrate the holiday season. 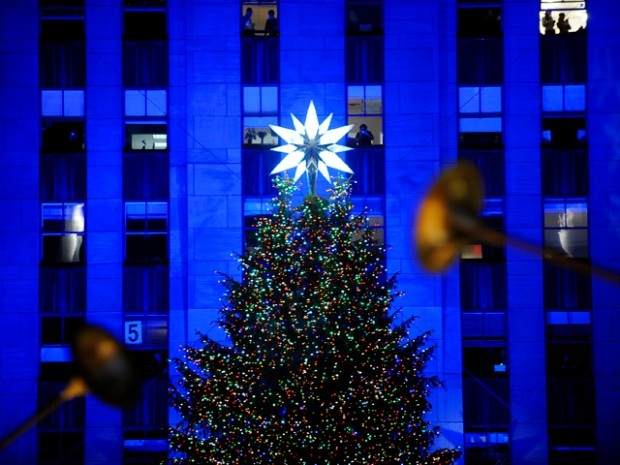 There's so much the city has to offer, like this tree lighting," said Karim Muasher, 26, of New York City. This year's tree lighting ceremony looked a little different. Producers at NBC decided to forgo ice skating performances this year in favor of getting some audience members closer to the action. The famed ice skating rink was be covered with carpeting so onlookers could stand right in front of musical performers.